For Inflatable T Rex Adult Costume,Keep away from fire , the material is not fireproof ,it's dangerous to close the fire . Securely cinch all drawtrings so air cannot escape The costume suit for games,halloween ,cosplay, bars, clubs, dance PARTY, parks, television programs, supermarket chains, hotel chains, the annual events, carnival, festival, opening ceremonies, weddings and so on. Simple using method and fantastic look is your best choice for your fancy dress party time. 1: Use a screwdriver to unscrew the screw in the battery pack, put in 4 AA batteries in battery pack , then fix the cover . 4:step into costume and clip battery pack to your own clothing.move battery-pack switch to ON position . It wil take about some minutes for air inflating with our strong power blower fan,you don't need to wait too long . 5: Finshing! Kids T rex inflatable costume has been inflated enough ,Kids can walk now like a king of dinosaur world !!!!! 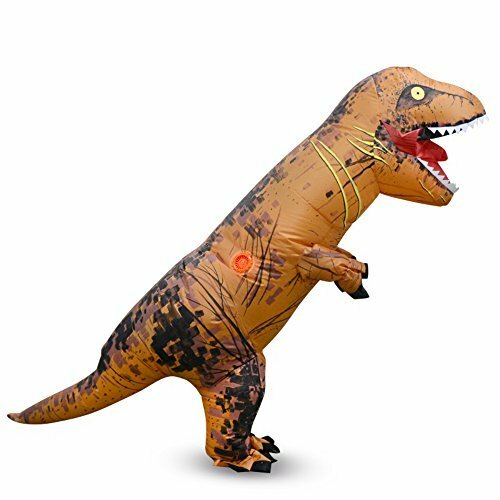 Package content:1 x Children inflatable trex costume, attention please! please remove costume from the bag carefully , becauser there are one fan and battery pack inside to avoid broken case. If you have any questions about this product by yuanyistyle, contact us by completing and submitting the form below. If you are looking for a specif part number, please include it with your message.